Dylan Williams rides Willie Mosconi to victory in the Zoetis Prairie Meadows Starter Allowance. ALTOONA, IA�SEPTEMBER 13, 2014�Willie Mosconi left on top under jockey Dylan Williams and finished in command to win the Zoetis Prairie Meadows Starter Allowance Challenge Saturday night at Prairie Meadows. The IVORY JAMES 5-year-old defeated Storm Hero by 1� lengths with Shakalo finished half-a-length back in third. Willie Mosconi completed the 350 yards in a quick :17.571 seconds, a 95 speed index. Owned-and-trained by Jorge Escalera, the gelding picked up $8,726 to bring his earnings total to $71,013. The win also earned Willie Mosconi a starting spot in the $75,000-Guaranteed Zoetis Starter Allowance Challenge Championship on October 18. 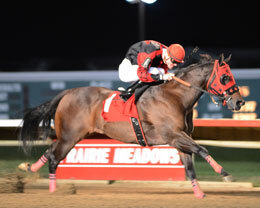 Owned-and-trained by Ricardo Martinez, Stormin Hero earned $3,726 for her second place effort. Yordanis Amaro rode the Texas-bred filly. Todd and Jodi Horton is the breeder. Trainer Charley Hunt saddled Shakalo for owner Michael Teel. Ridden by Stormy Smith, Shakalo earned $1,818. Ann and Brad Tate bred the bay gelding. Completing the field were Papa Jack, Rock Zar, Volcoms Crash, Cartels Runaway and Eye Fly Bye.